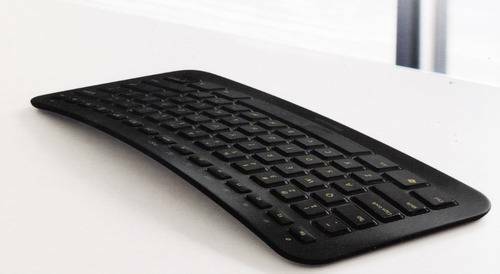 Setup: The Arc keyboard does not come with any software. It is supported out of the box by all versions of Microsoft Windows. 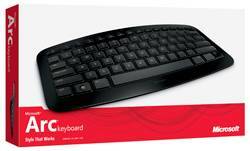 The keyboard includes a stowable 2.4 GHz receiver, and two AAA batteries. Installation is as simple as putting the batteries in the keyboard and plugging the micro-receiver into an available USB port. Once the keyboard is detected, it's ready to go once powered on. Powering the keyboard on consists of pressing the Fn key in the bottom right corner of the keyboard and then pressing and holding the Esc key on the upper left corner. A green LED light in the upper right corner of the keyboard will shine momentarily, indicating the keyboard is on. 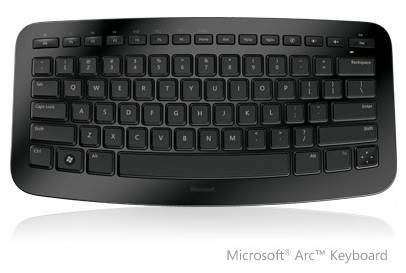 The Arc keyboard is the smallest keyboard I've ever come across. 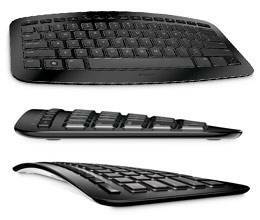 I regularly use the Microsoft Entertainment 8000 desktop set, and side by side comparision shows the Arc keyboard to be considerable smaller. Nevertheless, it is a very easy keyboard to type on. For the most part, all the keys are where muscle memory expects them to be. There are a few exceptions. First, the directional arrow keys have been merged into a single key that toggles in all four directions. The upper row of function keys have the F1 through F6 keys shared with the F7 through F12 keys. Pressing the Fn key activates the upper set of fucntion keys. This frees up the other seven keys along the top for other key roles, such as Home, End, PgUp, PgDn, mute, Volume up and Volume down. Lastly there is the Del/Ins key. The main keys on the keyboard are laid out normally. The design of the keyboard is very appealing as well. The casing is a shiny black finish. The keyboard arcs up in the middle, so the middle keys are a little higher than the keys on either side. Ultimately, I find the keyboard very easy to type on despite it's compact size. And the Arc looks slick on the desk as well. Obviously, this keyboard is for the mobile user. But I find that it makes for a nice desktop keyboard as well, depending on your desktop usage. The Arc does not have a numeric keypad, therefore wouldn't be ideal for users who use spreadsheets or other number intensive applications often. The keyboard is also available in a white design for Mac lovers, which interestingly enough has a yellow bottom. I've been a fan of Microsoft's hardware products for a long time. That being said, this keyboard is no exception. It is well made, easy to type on and very attractive. It's not designed for every computing environment. 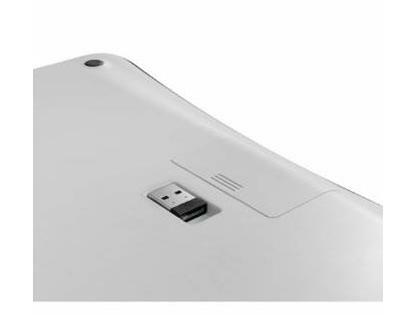 But with the micro-receiver that attaches magnetically to the bottom of the keyboard, and the sleeve for transporting the keyboard with other mobile devices, it makes for a very nice mobile accessory.